Like many artists, I feel more comfortable making art than talking about it. I have discovered, however, that it is a worthwhile experience to try to articulate my artistic process. My approach to painting is an emotional, intuitive process. My paintings continue to go through changes and transformations. Sometimes, it is easy for me to be seduced by the details of a painting -- the way paint drips, serendipitous color combinations, and exuberant brushstrokes. 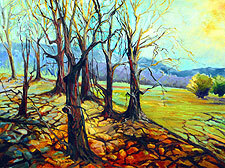 Often I can only see the whole when time has passed and I can look at one of my paintings from a different perspective. Ric Campman talked about a painting never being finished -- he used the word "pause" to describe a painting at a given point of time. 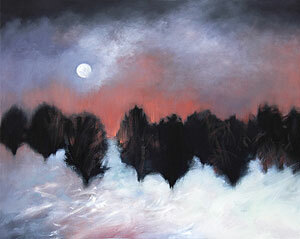 Artist Helen Hawes describes her work as going through past lives, current lives, and future lives. This perspective has been liberating for me. I believe transformation of a painting from one stage to the next parallels personal growth -- each new sensation or experience altering me in some way. Each time I paint I bring a new perspective and vocabulary to my work. 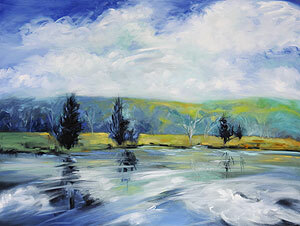 I am getting much bolder about repainting finished paintings, using them as a jumping off point for new paintings. While my painting style is very recognizable, it is continually evolving, sometimes expressed more abstractly and sometimes more realistically. My inspiration always comes from my deep connection to nature. Inspiration - The continually changing New England landscape and the vastness of the Southwest inspire my paintings and my impressions are conveyed through bold color and gestural brushwork. I have lived and painted in Vermont since the early sixties and have spent time and painted near Big Bend Texas, where we have a rustic adobe house. 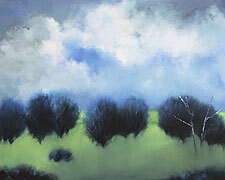 Recollections - Moods are evoked by the places I've seen and I recall them in my studio. The sensual wealth that surrounds us is transformed into my own appreciation and sense of place. I draw inspiration and energy from dramatic skies, constantly changing light and the intimate details of nature as well as its infinite scale. Explorations - Recent paintings explore water in varied dimensions, from the pond bottom through layers of water, to surface tension and reflection, to water splashes and ripples. Process - I begin a new painting at the top and work my way down, working quickly to establish mood through color and composition. I allow the paint, drips and accidental color combinations to guide my vision. 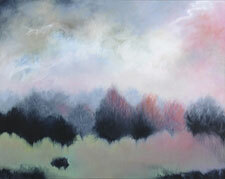 I use orange, brown, green and shades of gray in my skies to create the mood and feeling of weather, skies and water. Painting larger has allowed me to be more spontaneous and explore paint in a different way. Creating a painting is often full of frustration when I can't get it to "work," but when my inner vision does materialize, it is one of the most exciting feelings. My paintings have a luminous, rich quality created by laying down thin glazes of oil paint on paper, canvas or panel. Layers are built up slowly after each has been softened and blended. I remove paint with turpentine and rags, re-apply, and remove again, repeating the process until the painting "works" and excites me. My finished paintings often don't resemble their beginnings; they go through a continual process of change. With a combination of persistence and luck, an exciting painting may result. "As she reinterprets the natural world, Hawkins paints with supreme confidence, a mature yet evolving personal aesthetic, and a total mastery of color. . . . All of Hawkins paintings are structurally robust. 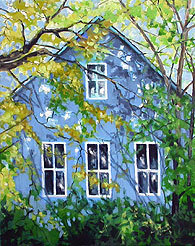 When her colors become equally exciting, the paintings truly sing."